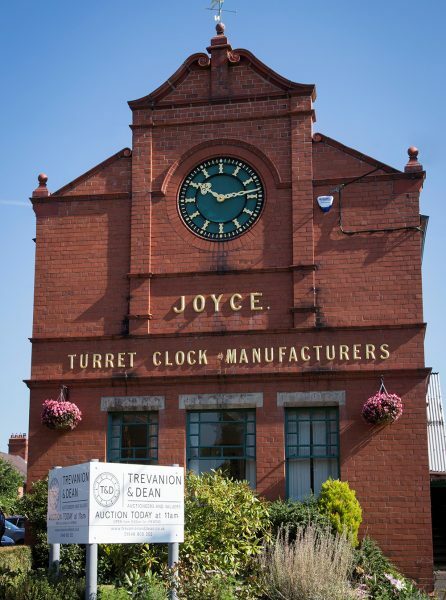 Trevanion & Dean auction galleries are located within the red brick clock factory built in 1904 by Joyce Clocks of Whitchurch to construct their famous tower clocks. The elegant facade, with its original clock, is known to everyone locally and to historians, clock connoisseurs and enthusiasts the world over. It is believed that Trevanion & Dean is the only auction house in the country to boast such a unique building. Joyce of Whitchurch, founded 1690 by James Joyce, claim to be the oldest continuous clock makers in the world, although since 1965 the company has been part of the Smith of Derby Group. Joyce began in the Shropshire Village of Cockshutt as a provincial long case clock maker and the business passed through the paternal line until in 1790, the decision was made to move to a large factory on the High Street in Whitchurch. In 1902 the death of Ellen R Joyce, widow to John Joyce, brought ownership of the company to Arthur Joyce. He oversaw the erection of a purpose built factory on Station Road with easy and quick access to the train station. The company remained here until 2012 when production ceased. The contents were sold by auction and the factory remained empty until 2014 when it was acquired by Trevanion & Dean as an auction premises. With their own funds and support from The Regional Growth Fund for the Marches Local Enterprise Partnership the building was transformed from an empty shell into the glorious building that it is today. The horolocigal legacy provided by Joyce clocks and its different family members is, understandably, vast. With longcase clocks, dial clocks, pocket watches, sun dials, barometers, compass’, tower clocks, station clocks, furniture clocks, memorial clocks, town clocks and commercial clocks found the world over. Indeed since 1965 the company installed more than 2000 public clocks in Britain and Ireland alone. There is probably once closer to you than you think! At Trevanion & Dean we are honoured to be custodians of such an important building and history. When designing the auction house layout our aim was to incorporate as much of the buildings features as possible. We are especially pleased to have retained the original Joyce tower clock and have incorporated it into our auctioneers rostrum. Clients can freely see and inspect the clock on view days or by appointment. Click here for further information on the history of J B Joyce.